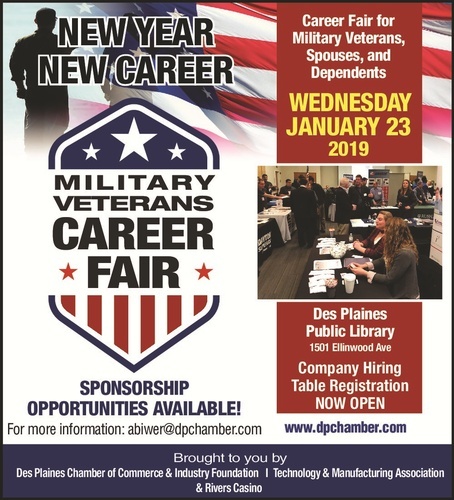 Thank you for registering for the Veteran’s Back to Work Career Fair on Wednesday, January 23, brought to you by the Des Plaines Chamber of Commerce Foundation. Please read the important information below and attached regarding set-up and other information for the event. 1:00-2:15 p.m. –Career Fair Table set-up location: MEETING ROOM B & C. * At 2:00 p.m. we will be hosting a Private Welcome Reception for you in Meeting Room A.. Please plan to attend (more info below). All tables must be set up by 2:00 p.m.
Each company will get a 5-6 ft. table and two chairs, two generic name tags with your company name. Please bring table cloth and/or promotional items that will fit on the table space, including pop up signs (space will be limited so any signage should go on your table top or directly behind the table not to the side). Sponsor tables are reserved. All other tables will be assigned on a first come basis. Please bring plenty of employment applications and any additional items that will attract candidates to your table. We will be hosting a Welcome Reception. Representatives from the VA., local Veteran Business Leaders and some of our recent graduates of our “Back to Work Boot Camp” Light beverages and snacks will be provided and will be provided in this room throughout the fair. 2:30 p.m.- 6:30 p.m. MEETING ROOM A : Will be available for semi private interviews should the need arise. The Career Fair will be open to the public from 2:30 p.m.-6:30p.m. At registration we will be collecting resumes. Any attendee without a resume will be given a blank form to complete. The parking structure is a building attached to the south wall of the library and has free parking in marked areas. BUT it is limited to 3 hours DURING work hours 9am-5pm. After 5pm there are no restrictions. *You may also park in the lot east of the library in the area marked in the attached map. Disregard the 90 minute limit. The Des Plaines Police have be informed about the Fair and will not ticket this 90 minute area. * parking sign needed and was emailed to you last week. Please avoid parking directly in front of business and we highly recommend car pooling so we have spots for attendees. * Career Fair located on the 1st floor right across the street from the Metra Station.